"So, how is it like living under capitalism? ", Lenin asks. 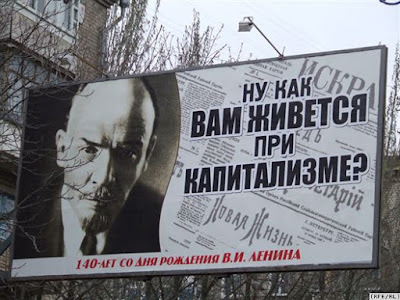 Archive Photo: Billboard in Lugansk. Do you remember the Soviet Union where the retirement age for men was 60 and for women 55 years? Well, in capitalism's Russia such privileges for the working people cannot exist anymore and the Putin-Medvedev government knows it. Russian lawmakers approved on Thursday a hugely unpopular government plan to hike the pension age that has led to protests and a record slump in Vladimir Putin’s approval ratings. A total of 327 lawmakers in the lower house or State Duma, voted in favour of the bill in its first reading, with 102 against. The anti-people legislation is going to raise the pension age to 65 for men and 63 for women. On the eve of the vote approximately 1,000 people protested against the reform in Moscow while on Thursday hundreds of demonstrators gathered outside the Duma itself. Multiple initiatives and campaigns against the new governmental law were undertaken also by the Russian United Labour Front (Rot Front), in which the Russian Communist Workers' Party participates. Officially the Russian government used the pretext of "budget stability" in order to justify this anti-people, anti-worker measure. However, it seems that the majority of Russians disapprove the government's policy on this matter. More than 80 per cent of Russians oppose the reform and more than 2.8 million people have signed a petition against it. At the same time, according to the VTsIOM state pollster, Vladimir Putin's approval ratings slumped by a record 14 percentage points in the space of nearly two weeks — to 64 per cent on June 24 from 78 per cent on June 14.